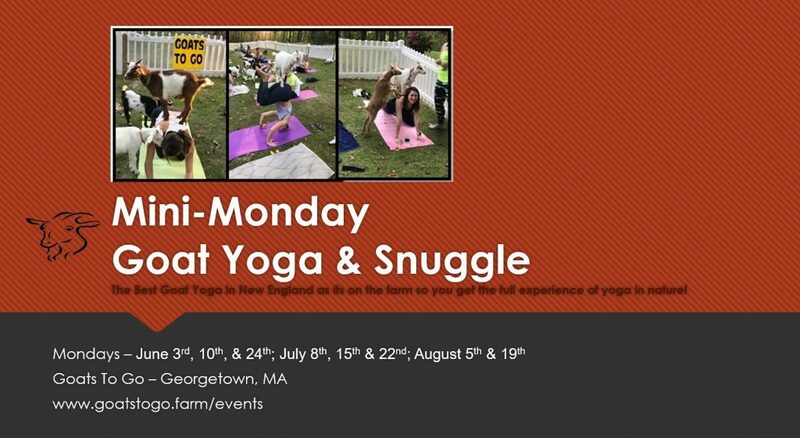 Join us on the farm for a 30 min session, or mix & match to come to an 1hr, of Goat Yoga and Snuggle accompanied by our baby fainting goat kids on a Monday Night. These will be upbeat classes as our kids will be bouncing on and off you throughout the whole class!!! Goat YOGA sessions include: 25 minutes of gentle yoga while the goats interact with you, and a 5 min cool down seated poses while you continue to hold, pat, snap pictures, and feed goat treats. Goat SNUGGLE sessions include: 25 minutes of seated mat time to pet and snuggle with our baby fainting goat “kids” while you feed goat treats, ask questions, and learn more about the goats care, health, and life on the farm. July 22nd. Aug 5th & 19th. Tickets: starting at $15 per person. Tickets are non-refundable. Appropriate for ages 12+ yrs old (younger with prior approval).